I remember the conversation so vividly, almost as if it happened yesterday, instead of nearly ten years ago. "Isn’t there anything that I can do to help fight the cancer?" I asked him. "You know, change my diet, get more exercise?" As a newbie cancer patient, I needed to play a more active role in my healthcare drama. I wanted to feel like I was doing something besides just "showing up," as scheduled, for surgery, chemotherapy and radiation appointments. At this point cancer treatment was starting to feel like a series of incredibly passive events: scary, unpleasant things, one after another, being done to me. Wasn’t there any way that I could be a more proactive partner in my own healing process? From the look on my doctor’s face and his quick response, it was clear that he had handled this particular question before. "There’s no research suggesting that changing your diet or increasing your daily level of exercise will have any impact on your cancer," he recited, before leading me down the hall to a room I soon nicknamed The Chemo Lounge. All these years later, I couldn’t help but think about this conversation again while reading the book Anticancer: a new way of life because brain cancer patient David Servan-Schreiber’s oncologist served up a similar answer to the very same question. But Schreiber’s oncologist added this postscript: "There is nothing special to do. Lead your life." Deeply frustrated by his doctor’s response, Schreiber made a decision to write a book exploring the body’s natural cancer fighting capacities, a book that he wished was available when he first received a cancer diagnosis fifteen years ago. To write Anticancer, the author reviewed the literature using his training and experience as a physician, researcher and former director of the Center for Integrative Medicine at the University of Pittsburgh. Anticancer begins with the premise that "cancer lies dormant in all of us." The author then poses the question: Why do some people develop disease while others do not? Anticancer explores the effects of environment, lifestyle choices and trauma on "the terrain" of our bodies. Schreiber believes that our bodies are designed to fight tumor development and that we can maximize those resources by the decisions we make every day. 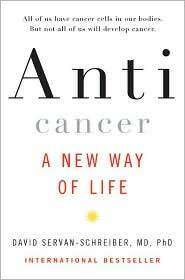 It is important to note that the author moves forward with his argument with the following caveat; it is "unreasonable to try to cure cancer without the best of conventional Western medicine." The book balances research and memoir, moving smoothly from healthful benefits of diet and exercise, to the story of how Schreiber’s brain cancer was diagnosed and treated. As he moves towards recovery, Schreiber explores the writings of Jon Kabat Zinn and Rachel Naomi Remen. He experiments with self-centering and meditation. Before long, he comes to believe in the healing value of resolving past traumas and letting go of anger in his relationships. Clearly the cancer experience is life changing for Schreiber. In a sense, he feels reborn. Schreiber begins celebrating the date of his diagnosis as a special time, "a little like Yom Kippur or Holy Week fasting for Ramadan…I think about what happened to me, the pain, the fear, the crisis. I give thanks because I was transformed…"
The author’s efforts have resulted in a wonderful book that is a marvelous mixture of readable medical information, practical suggestions, patient anecdotes and alternative medicine. Add it to your oncology shelf.